Fossil Creek is located a few miles west of Strawberry Arizona. This creek may be the best example of a spring fed stream in Arizona. 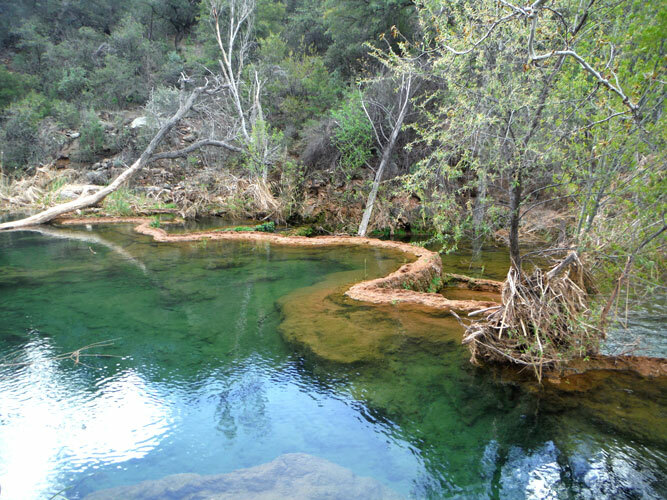 In the upper canyon, a series of springs provide nearly 20,000 gallons of water per minute to the creek's flow! That level of flow has only been recent in the creek's history however. A dam was constructed, in the early 1900's, to divert the stream into a flume that fed two small hydroelectric plants located several miles downstream. That diversion lasted until 2005 when the hydroelectric plants were de-activated. Since the return of the water to the creek, Fossil Creek has been rejuvenated and is now a very scenic, riparian corridor through Fossil Creek Canyon. These were some of the views of Fossil Creek that we had while on a 3 day packpack trip in March of 2017. The natural dams are made of travertine, a rock type formed from a calcium rich compound carried by the spring water. 80 of these travertine structures have been identified in Fossil Creek. Similar formations are found in Havasupai Canyon. The water here in Fossil Creek is not the intense turquoise color seen in Havasu Creek, but is still pretty neat! The flow in Fossil Creek upstream from the springs is seasonal. When we were here, run-off from the past winter's precipitation was fueling the discharge. The appearance of this upper creek is quite different from that of the stream below Fossil Springs. 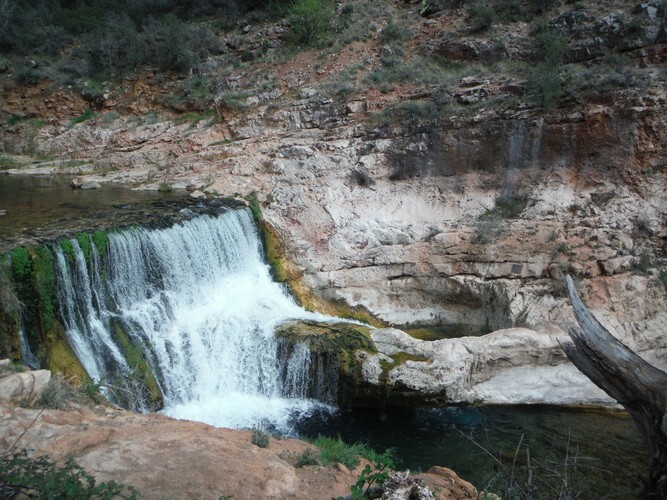 The restoration of the natural flow to Fossil Creek created such an oasis that, within a few years, a permit system had to be implemented to control the crowds of people who were attracted to the area. From April 1st to October 1st, access permits must be acquired in order to visit the creek. Entry during this permit season is limited to day use only(8am to 8pm). 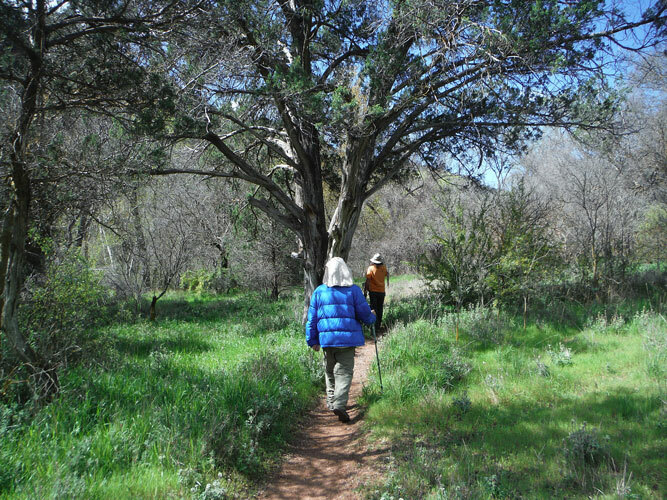 Outside of the permit season, visitors are free to come and go at will and overnight camping is allowed upstream from the Old Fossil Creek Dam. 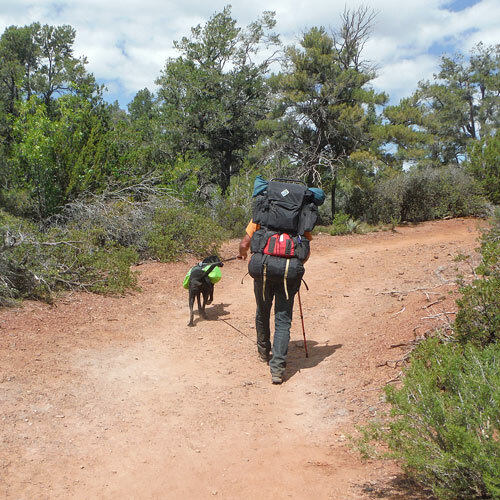 The Coconino National Forest administers the Fossil Creek Permit area. Their web site provides a description of the rules and the procedures to acquire the permits when those are necessary. We originally planned our trip to Fossil Creek in early March in order to be able to spend 3 days along the creek. Heavy snow along the rim forced us to postpone to the end of the month. We wondered whether we would encounter a rush of people, who like us, would be trying to get their visit in before the change in the access rules. As it turned out, only a few people were seen each of the 3 days that we were in the area. The trail terrain varies. There are many sections that are steep and rocky. 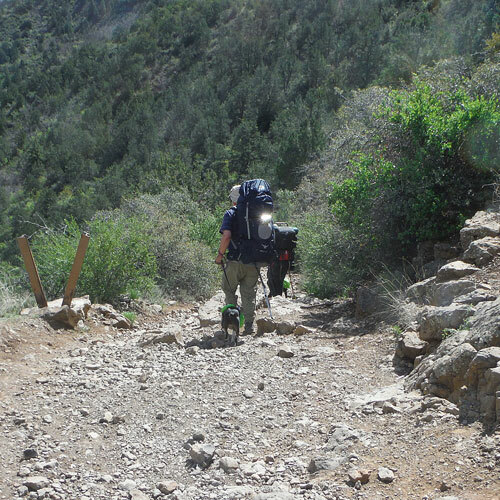 This hike reminded us of some of our treks in the Grand Canyon. We began our hike on the afternoon of our 1st day in the area and in a bit less than 3 hours were at the bottom of the trail. Two of the guys brought their dogs along. The animals handled the trail walking very well. The initial views from the trail are out to the north. Nash Point is the prominent landmark in the distance. 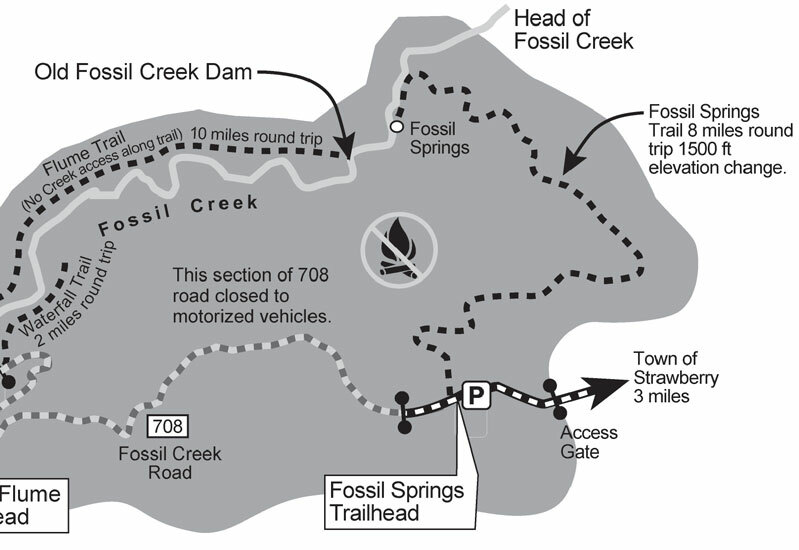 The Fossil Springs Trail runs to the base of the point where it then turns to the west. After the turn in the trail is made below Nash Point, the drainage of Fossil Creek Canyon can be seen extending to the southwest. Fossil Creek, itself, does not become visible until the very end of the trail. 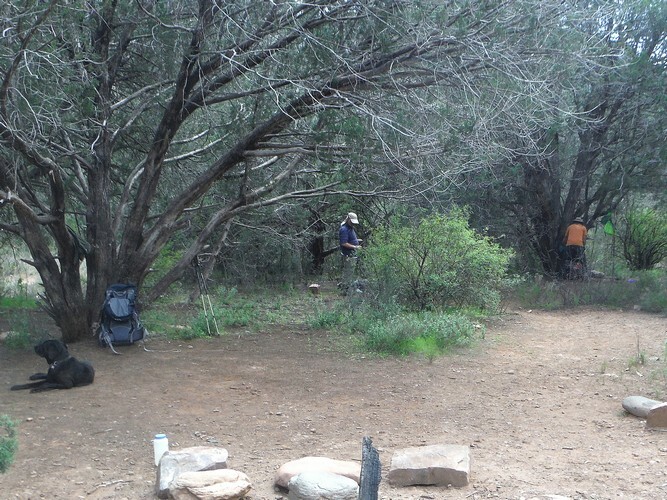 The dispursed camping areas in upper Fossil Creek are very basic. There are no tables, outhouses, or other improvements. No camping is allowed within 100' of the creek. Gas stoves are allowed, campfires are not. This is a Pack it In-Pack It Out zone... Our objective on this trip was to set-up a base camp and then explore outward from there. This spot was near the 1st creek crossing. It did not take much discussion to decide that this was home. The next day was spent exploring the area. 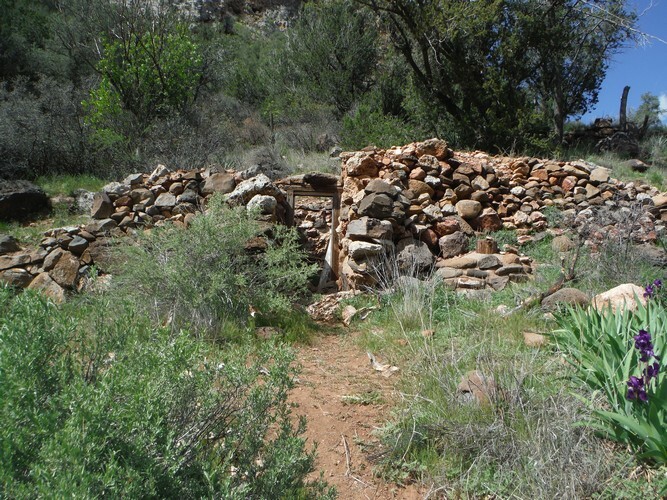 Our 1st priority was to dayhike down to the site of the Old Fossil Creek Dam. Fossil Springs was a short distance downstream from our camp. With water flowing in the upper creek, the output from the springs was somewhat disguised. In the center of this photo, the bubbly area at the base of the tree, reveals one of the springs. A well-defined path continued on downstream from the springs. We were too early in the season to take advantage of any trail side snacks from the berry plants growing along the way. This is the old Fossil Creek Dam. 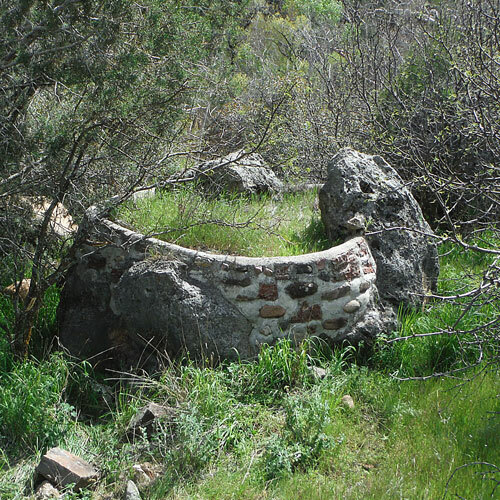 Constructed around 1909 or so, this was the location at which the flow of Fossil Creek was diverted into the system of flumes and pipes to generate electricity at the Childs and Irving power plants downstream. Many hikers believe that this feature is "The Waterfall", a well-known landmark in Fossil Creek. "The waterfall" is actually a natural feature that is several miles further on downstream. The pothole is called the "Toilet Bowl". An opening in the side of the hole allows persons who are brave enough to be "flushed" through....Even though it is not "THE" waterfall, this location is the objective for many of the hikers that come down the Fossil Springs Trail. When we were here, there were only a few other visitors. Prior to 1970, a dam keeper/caretaker lived near the dam site. The caretaker's primary duty was to keep a "trash" screen at the intake of the flume free from debris floating in the water. When an automatic trash rake was installed, the caretaker was no longer needed. His house was torn down shortly afterwards. A dugout in the hillside remains. 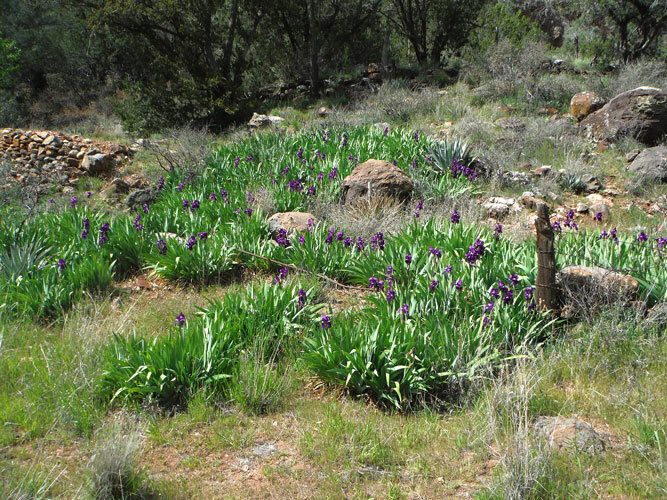 A large bed of Iris was blooming at the time of our visit. 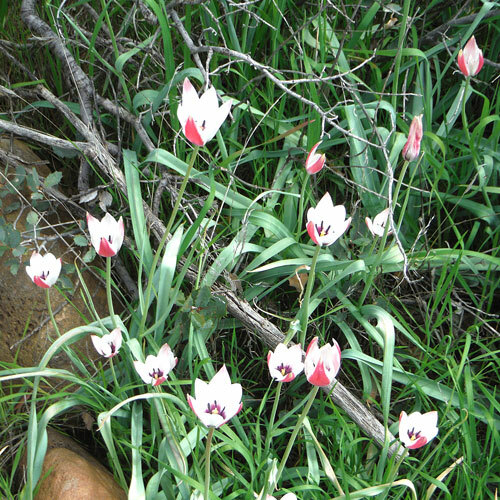 These flowers are common at many old homestead and ranch sites. Another patch of attractive flowers was also growing near the old dam. I wondered whether they could be a variety of tulip? I think that the obvious guess would be that this structure was some sort of tank or tub, but for what purpose? After the de-commisioning of the power plants, most of the system was disassembled and removed. It seems to me that some small part of the operation could have been left in place to be appreciated by current and future visitors. This hydroelectric system was one of the earliest to be constructed in Arizona. It took a major effort to install and make work. This website notes the system's early history. And this link leads to a pdf booklet, "A Wonderful Water Power" that contains many historic photographs. One of the photos shows the damkeeper/caretaker's home and another shows the Fossil Creek Dam and the head of the flume as it existed in 1999. This relic, seen near the dam site, looks very similar to buckets I have found elsewhere that were used on waterwheel transfer systems. Was such a machine once used here at Fossil Creek? Not far below the old dam site, the Flume Trail, which was the route for the old flume, moves up onto the west side of the canyon high above Fossil Creek. It was there that we ended our exploration downstream. A walk upstream from our camp completed our second day. On our third morning, with cool temperatures and clear skies, we made the hike out in just a few hours. We had really enjoyed ourselves on this outing and have decided to return in the late fall and perhaps explore a bit further downstream. We may try to do a loop trip to include a walk up the old Forest Road that once was used to access the power plants from Strawberry.